My Tampa Bay Mommy : Michaels Doorbuster Deals Today (11/23) Only - BOGO Ugly Sweaters, Fine Art, Wilton and Yarn! Michaels Doorbuster Deals Today (11/23) Only - BOGO Ugly Sweaters, Fine Art, Wilton and Yarn! Today (11/23) only, head on in to your local Michaels store for some great today only doorbuster deals! Plus, here is a 40% off one regular price item, you cannot use this on sale or doorbusters. Buy 1 Get 1 Free Ugly Christmas Sweaters (valid in store only). 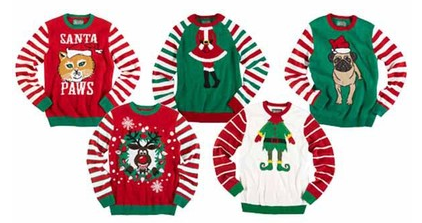 The Ugly Christmas Sweaters are priced at $29.99 each, so just $15 each each after the BOGO sale. Plus through November 26th, score $3 flat-rate shipping on all orders with the code: 3TURKEYW at checkout. *Don't forget that tomorrow, Thanksgiving Day (11/24) get 30% off your entire online purchase including sale items with the promo code: THANKS116 at checkout. You can also shop at your local Michaels store from 6PM-Midnight only on November 24th and use the coupon here to score 30% off your entire in-store purchase including sale items.